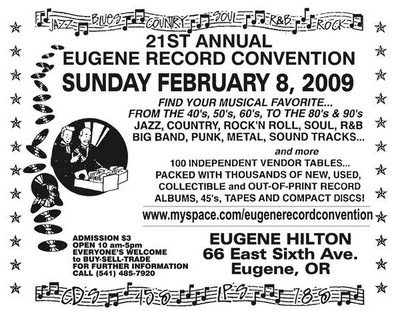 The Sunday Morning Hangover: Eugene Record Convention Interview! This Sunday February 1, I will be sitting round stax of vinyl with Bill Finneran organizer of the 21st Annual Eugene Record Convention at the Eugene Hilton on Feb.8Th. I will be asking Bill about vinyl, how he started all of this, his EBay biz and collecting records.In between I will be playing songs about records, jukeboxes, and phonographs. Tune in this Sunday at 10 AM if you love vinyl to The Sunday Morning Hangover on KWVA 88.1 Eugene streaming at www.kwvaradio.org. I will have a table of cheap records at the convention so please come by , say Hi ,and buy some of my records. But most of all listen to the program on Sunday Morning!Call us at 541-346-0645!